Meeting author Susan Joyce in person was a highlight of my trip to South America. We had originally connected through the Facebook group, We Love Memoirs two years earlier. 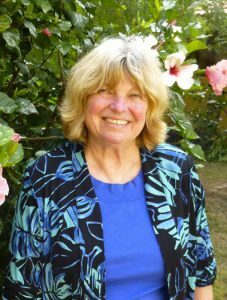 Susan has written two memoirs, and authored and edited numerous children’s books with her husband, author Doug DuBosque. In addition to writing award-winning books, Susan has lived in several countries and ran a thriving publishing business with her husband for more than two decades. After all that, plenty of writers would have been content to retire. Yet when Susan spoke to me about her latest writing passion–screenwriting–her radiant energy was infectious. I´m pleased to have Susan as my guest this week. What led you to screenwriting? My heart led me to screenwriting. I´ve always enjoyed the theatre and films; even turned two of my books for children into stage plays with original music; songs I had written and by collaborating with an elementary school music teacher. Great fun! A thrill to see the productions performed on stages in schools and at a community college in Oregon. Describe how the screenwriting process differs from writing books. Screenwriting is a different art form using different set formats. It´s a challenge and exciting to learn new ways to express my imagination with words in a community which encourages writers to think outside the book box; to SHOW and not TELL. I receive advice, again and again, to write more books. The more the merrier for fans and followers. When I dreaded “making time” to write, I knew I needed something different to stay excited about creative writing. Script writing is fun, feels as if I am playing with words as I imagine the scenes they fit into. A book or a film originate in the writer’s imagination first. Once the writer writes her version on paper, the script begins a new life when others involved in the production process; the editor, the director, the producer, the cameraman, etc share how they imagine it. Like magic, the final creation becomes a dance shaped by the keen observation of others from different angles. How do you engage with a writing community from your home office in Uruguay? In today’s internet world, it’s easy. I belong to several online screenwriting groups and attend online workshops where I can share ideas and pitch my projects. What takeaway do you have for other writers who face burnout? Ask yourself what makes you tick, what makes you happy and move forward to a new adventure. At the moment, I’m turning my book Good Morning Diego Garcia into a screen script and into a mini-series for television. Hopefully BBC. I will do the same with my first memoir, The Lullaby Illusion. I’m also writing a TV series set in a jazz club in Germany where expats gathered to make new friends in their new homeland. For more information, you can find Susan at Susan Joyce Journeys. Or click here to connect on Facebook. Here her books can be found. Join my mailing list to receive the latest news and information. "This book is a remarkably eloquent and harrowing account of a journey that would tax any parent. The book’s conclusion could hardly be a more resounding tribute to the human spirit." "Pieces of Me is an important, honest, and heart-rending story of a brave young mother’s struggle to save her precious daughters—no matter the toll it takes on her, as she through it all carries the double burden of reliving her own childhood trauma." - Lene Fogelberg, author of the Wall Street Journal bestseller Beautiful Affliction. "Lizbeth Meredith writes hauntingly about an all too common experience - domestic violence - and its ultimate aftermath: kidnapping. In the face of a mother's nightmare, she summons all her resources to recover her daughters. Pieces of Me is powerful testimony to one woman's courage and resilience in the face of seemingly insurmountable odds and to the unbreakable bonds between a mother and her daughters." "Pieces of Me is the inspiring tale of how a quietly powerful woman overcame bullying, abduction, arrest and being failed by the authorities in two continents to free her daughters." "I love me a woman that can do a James Bond."